Save food, space, and money with Lock & Lock. 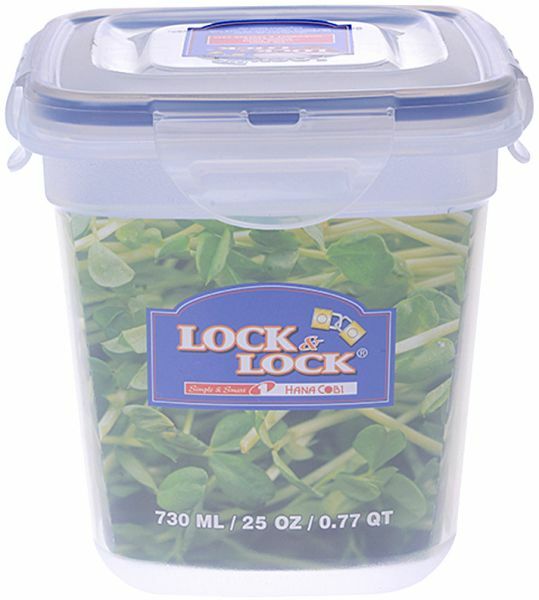 Seal your meals with Lock & Lock's unique silicone seal and locking-tab system that makes their containers both airtight and watertight. Best of all, Lock & Lock containers are safe for the dishwasher, freezer, and microwave—making them the perfect choice for cabinets, refrigerators, and beyond. Airtight Lockage - All passed the leakage tests by authoritative local and international institutes. 4-side of locking system of lock and lock makes it possible to be airtight due to equal pressure to all 4 sides. Durability - It has passed the KEMTI's bending test. The container and the wing were fixed the bending test machine and bent. Healthful Living - Used superior raw material with durability and heat-resistant ability which is friendly to the human body. Passed the strict hygiene and safety tests of U.S. FDA and German SGS. Space Saving Design - Stacking system aim to help space saving. The design of the containers enables excellent space saving in the refrigerator, freezer, cupboard and drawers. Do not use abrasive cleaners and scrubbers. Silicone seal can be removed for cleaning if necessary. Do not use a sharp object to remove. Unlock all four latches and loosen lid before use in microwave. The container base and lid are microwaving safe for reheating purposes only. Do not use lid or base in oven, under browning elements or on stove top.